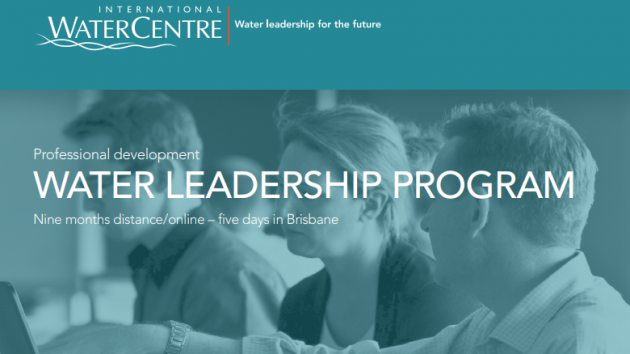 IWC’s Water Leadership Program Scholarships Now Open! The International WaterCentre (IWC) Water’s Leadership Program helps emerging leaders develop the abilities they need to exert influence, drive change and advance challenging integrated water management projects — abilities associated with the most effective integrated water management leaders. Download the Program Brochure for information on the program delivery, outcomes, benefits to you and your employer and costs. A range of scholarships are awarded annually to high calibre candidates who clearly demonstrate potential as future water leaders. These full and partial scholarships are available to domestic participants, including three full scholarships awarded annually, by the International WaterCentre in collaboration with industry sponsors for the Water Leadership Program. Scholarship applications are open to team, project and middle managers in the Australian water sector who are Australian citizens, permanent residents of Australia or New Zealand citizens currently working in Australia. Two full scholarships from Melbourne Water (AU$9,500 fees + AU$2,000 towards travel). Applicants must currently be employed by a local government located within the Melbourne Water supply area. For more information view the Terms and Conditionsfor this scholarship, and list of eligible local governments. Download the Melbourne Water Leader Scholarship flyer with full details here. Three full scholarships from Clearwater (AU$9,500 fees + AU$2,000 towards travel) for applicants from regional VIC. One full scholarship from Clearwater (AU$9,500 fees + AU$2,000 towards travel) for applicants from metro Melbourne. Two half scholarships (AU$4,750 towards fees and AU$1,000 towards travel) for applicants from anywhere in VIC. Applicants must currently be employed by a local government, water authority or catchment management authority in Victoria. To view the eligibility criteria for these scholarships, please click here. Download the Clearwater Water Leader Scholarship flyer with full details here. One full scholarship from Stormwater NSW (AU$9,500 fees + AU$2,000 towards travel). Applicants must currently be employed by a local government, water authority or catchment management authority in NSW. Applicants must also be Stormwater NSW members. Applications for the 2018/19 Water Leadership Program Scholarships close 30 September 2018. Click here for more details. “Very interesting presenters, extremely captivating and knowledgeable. The course was very informative, great venue and food, and great networking opportunities” – IWES Sydney 2018.